There is no mention in the 1871 census for Fairfield of either Heaton Place or Eaton Row, most residents of the area unless they lived in a Large House, Farm or Public House are just listed as living in Fairfield. The earliest mention I have found are children who started at North Road School in March 1879, 3 such children were Robert George Wilson, William Arthur Slack & Ada Bennett. In the 1881 Census Heaton Place is listed for the first time with 4 properties empty which may suggest that they were newly built. 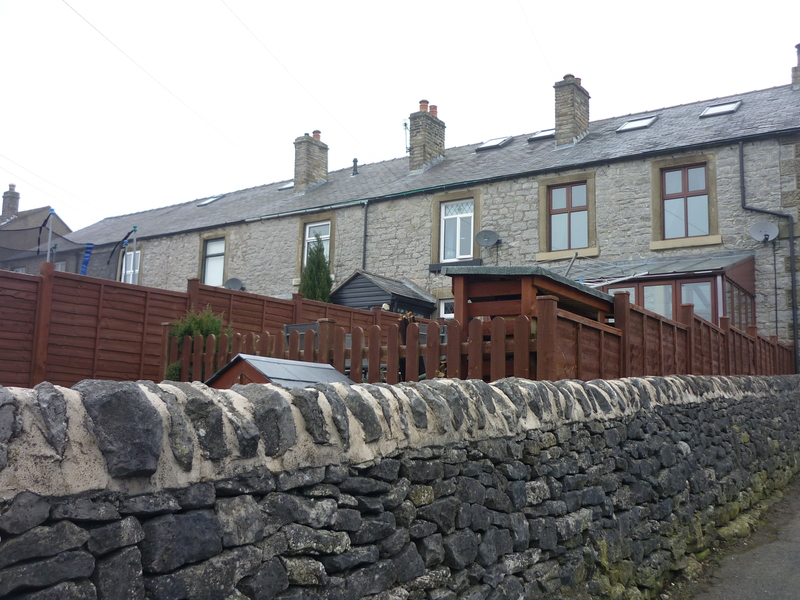 Heaton Place consists of two rows of cottages now off Ashwood Road. Wall sign on the cottages with Heaton Place on one side & Benson Road on the other side. 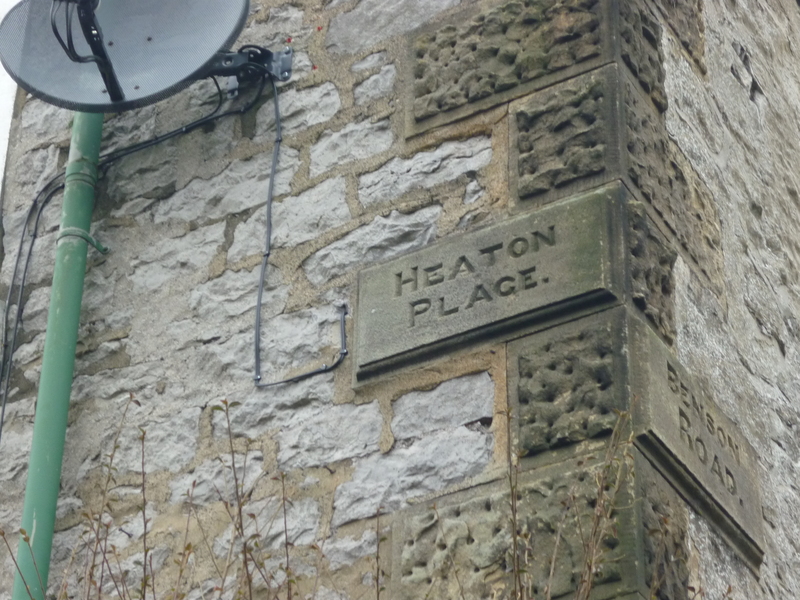 The wall signs on one of the row of houses clearly show that the row is called Heaton Place as the 1881 Census names them, however in the 1891 Census the properties are referred to as Eaton Row. I have as yet not been able to find out why the other roadside sign say’s Benson Road as the houses are off Ashwood Road, it may be that at some point Benson Road was re-named. In the 1881 Census when ‘Heaton Place’ is mentioned for the first time, the families living in the properties are as follows:- 1. James Wilson, 2,3 & 4 Empty, 5. John Wilson, 6. George Moss, 7. Henry Rogers, 8. Mathew Thorpe, 9. William Cordon, 10. Isaac Wilson, 11. Sampson Riley, 12. Empty. It has been suggested that the properties were built by a Property Developer who originated in Manchester, George Heaton. George moved to Fairfield between 1871 & 1881. In 1881 George aged 59yrs and his wife Fanny aged 41yrs were living at Heaton House which was situated on the corner of Queens Road and Bench Road. 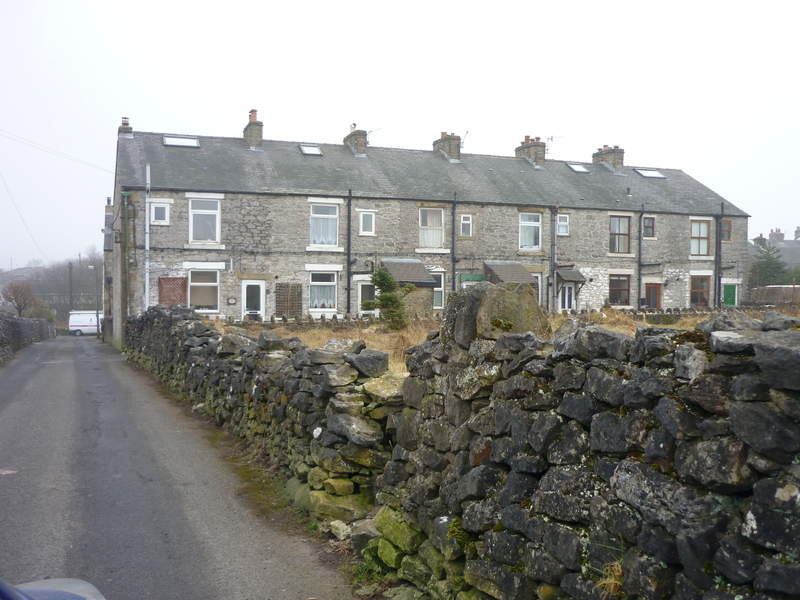 In the 1881 Census he gave his occupation as ‘Property Owner‘ as his house was named ‘Heaton House’ this would seem a reasonable conclusion as the cottages are in close proximity, that he was the developer of the properties. The conditions in Fairfield were very poor during the late 1880’s. The teachers involved the NSPCC on a number of occasions to visit the parents of children who the teachers thought were being ill treated. Families living at Nall’s Buildings off Queens Road, New High Street, Heaton Row and Ashwood Road were visited. 1887, The conditions in Heaton Row (Place) are recorded in the local Fairfield board minutes of December 12th 1887. At numbers 11 & 12 Heaton Row two sink stones were defective and there were 13 members of one family living in the one house with only two bedrooms. Bad drainage was also a problem. 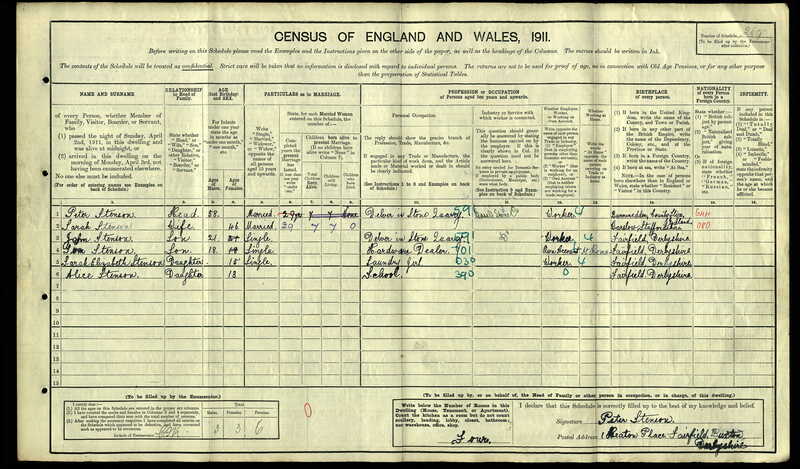 The 1891 Census now has George Heaton living at ‘Eaton House’. There were families living in Heaton Place in 1881/91 who were still living there at the outbreak of WW1 most notably the Stenson, Riley & Cordon families. 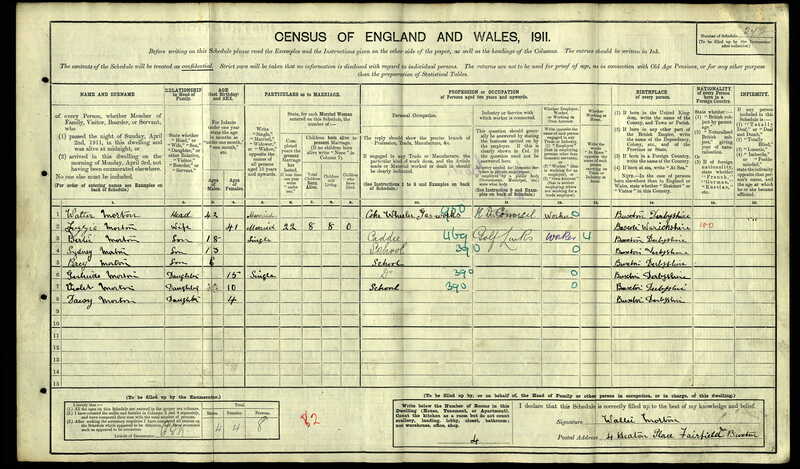 1911 Census for Heaton Place shows the following families living in the houses and what became of them during WW1, also listed are previous residents and the year they resided in the properties. 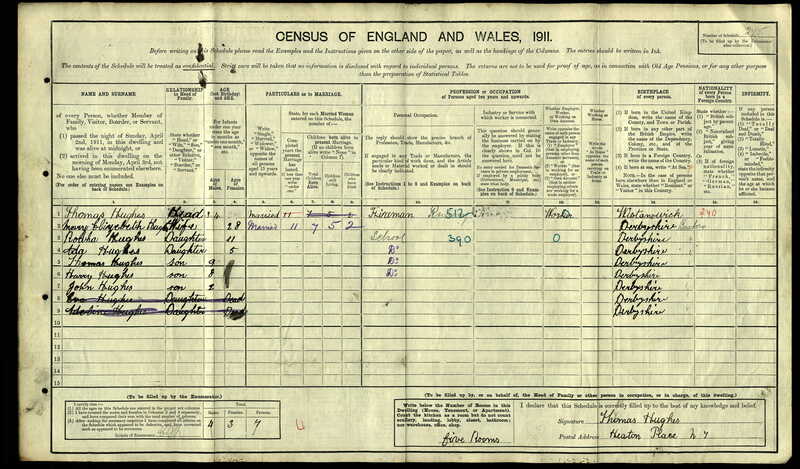 1894 November- Emma Richard and daughter Nellie, living with the Wilsons. 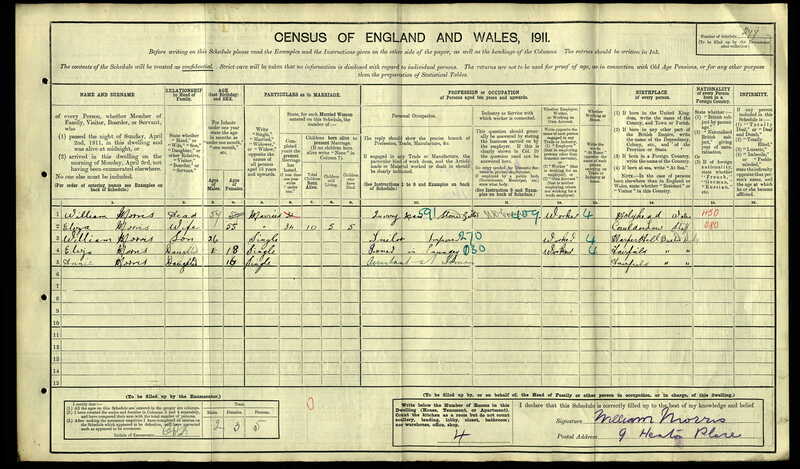 1891 Census: James & Mary Wilson. 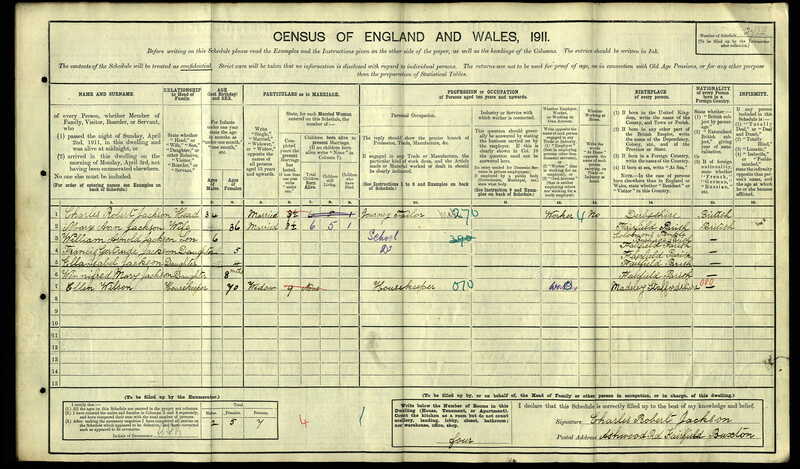 1881 Census: James & Mary Wilson. 1902 – Charles Vanes & Family. 1883 March – James Woodward & Family. 1895 April – Hannah Vanes and son Joseph. 1894 April – Hannah Vanes and daughter Martha. 1897 May- Walter Morten and son Louis W Morten. 1893 April-John Belfield and son John Thomas Belfield. 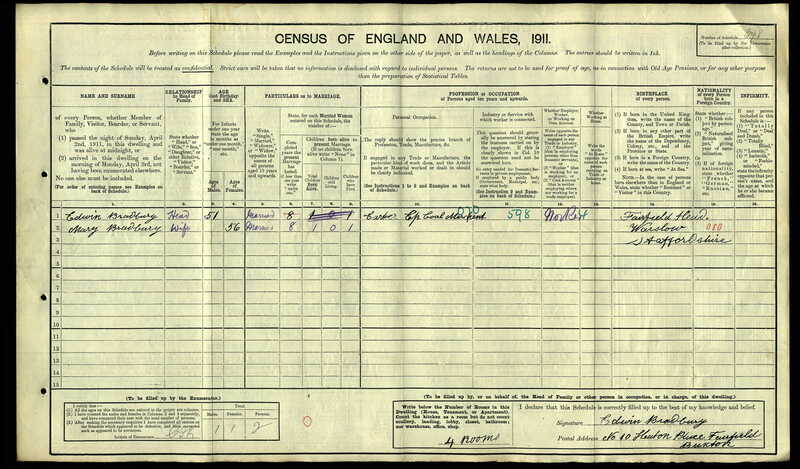 1901 Census: Peter & Sarah Stenson. 1893 April- John & Dora Allen with daughter Annie. 1891 Feb – Jno. Barker with son Andrew. 1888 April – Jno Barker with son Joseph. 1887 April – Jno Wilson with son Herbert. 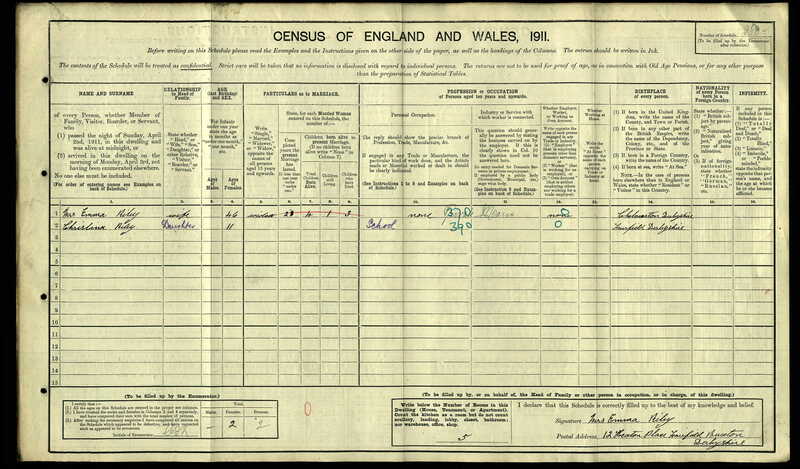 1881 Census: John & Mary Wilson. 1897 April – George W Knight with son George. 1894 April/Sept- Peter & Sarah Stenson with son Peter. 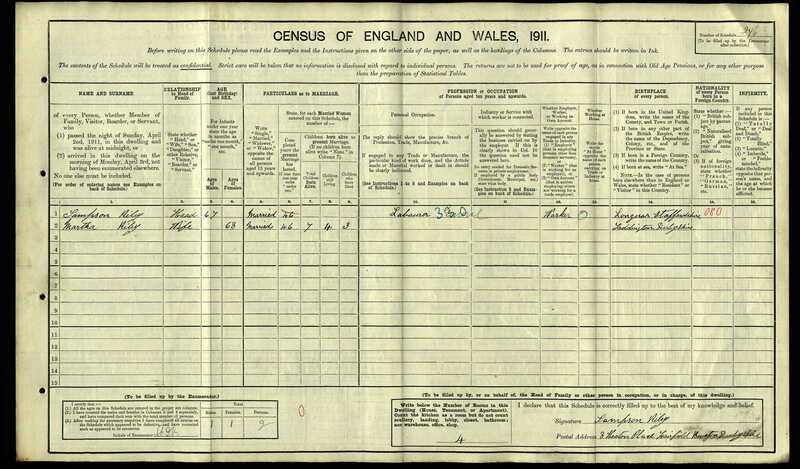 1891 Census: Peter & Sarah Stenson also living at the property was William Kirkham his wife & 2 children. 1890 Jan – William Wheeldon with son Jno. William. 1891 Feb – William Morris with daughter Hannah J. 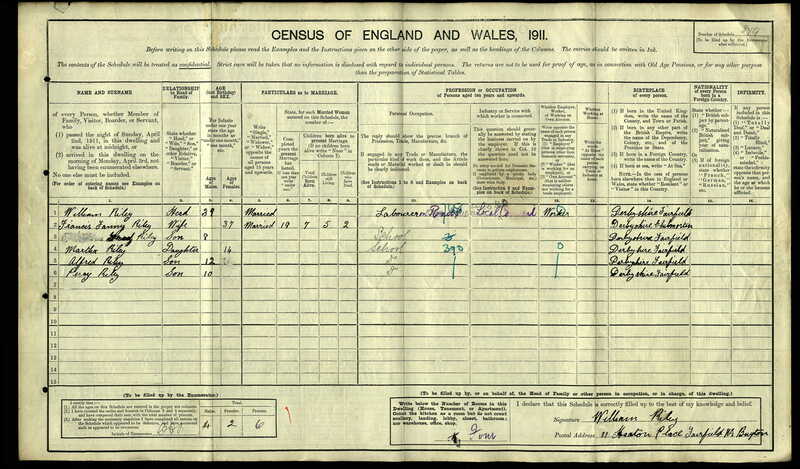 1901 Census: Henry Riley with son Arthur Riley lived at No 7, later moving to 73 Kings Road, Arthur died in 1920 @ home and is buried in St Peters Churchyard. Arthur was the cousin of Alfred & William H Riley both deceased during WW1. 1898 April – Henry Riley with son Sampson. 1896 April – William H Riley with daughter Mary. 1896 Nov- Henry & Sarah Riley with son Arthur. 1901- Pt 28151 William H Riley was living at No 8 with his Grandparents Sampson Riley, William was the Brother of Alfred Riley (also deceased) and the Cousin of Arthur Riley (also deceased) William died at home in 1918 and is buried at St Peters Churchyard. 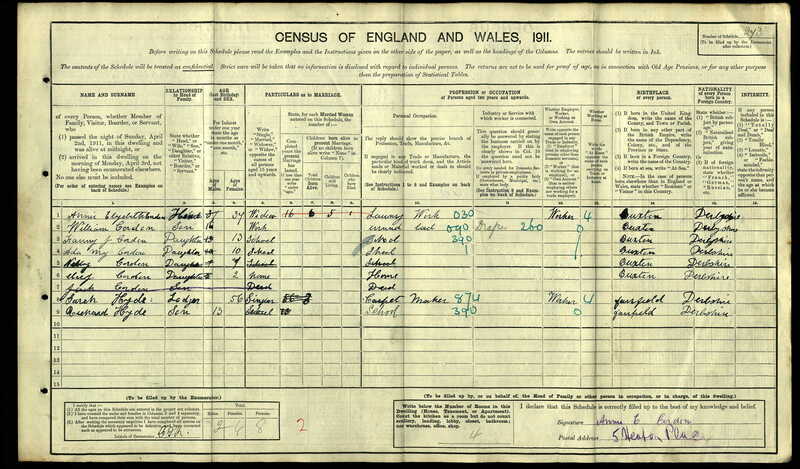 In November 1901 Isaac Wardle & his son Will are also living with the Riley’s. 1899 April – William Riley with son William H Riley. 1897 April – John Garlic with son Geoff. 1894 – Henry Garlic with son George. 1889 April – Sampson Riley looking after John Holmes. 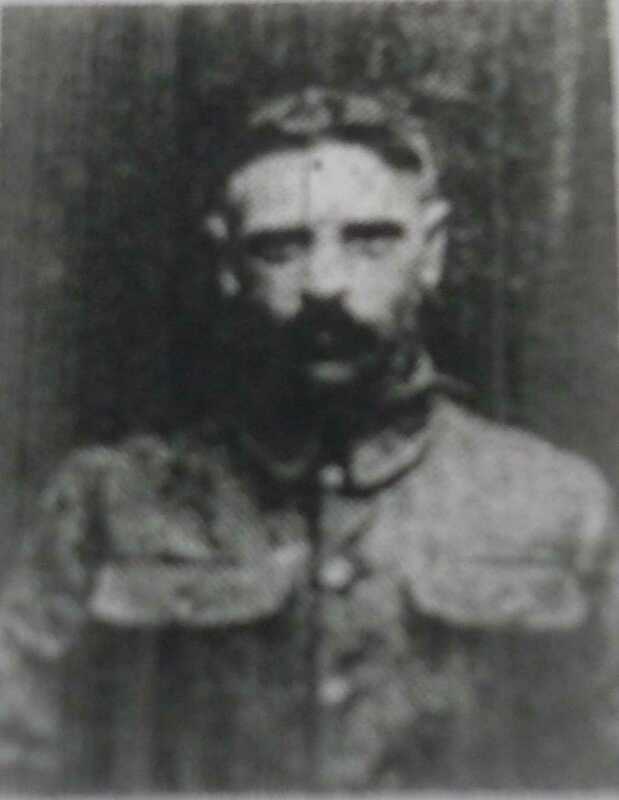 1913 – Lance Corporal 9211 Shillcock, Notts & Derby Regiment who survived the war moved to No 9 following his marriage to Eliza Morris in 1913, their first child Harry Jnr was born there. 1902 March – William Vanes with son William. 1892 June – Joseph Wheeldon with son Charles. 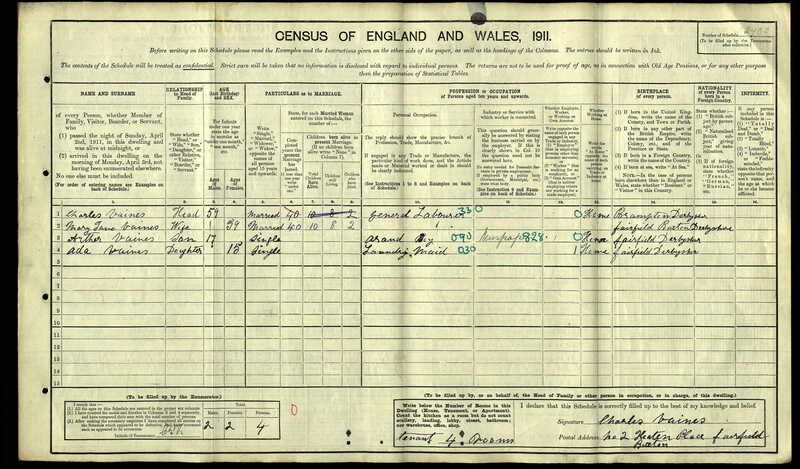 1884 Sept – Geoff Brinsley with son Arthur& daughter Ada. 1895 May – John & Emma Robinson with daughter Elizabeth. 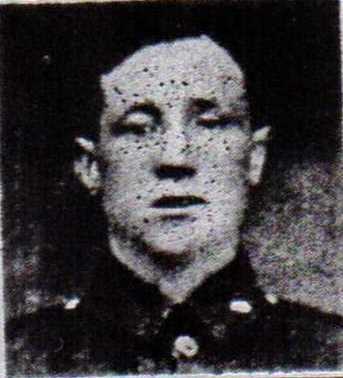 Pt 36134 Alfred Riley Notts & Derby Regiment brother of William Riley did not survive the war was living at No 11 in 1911. 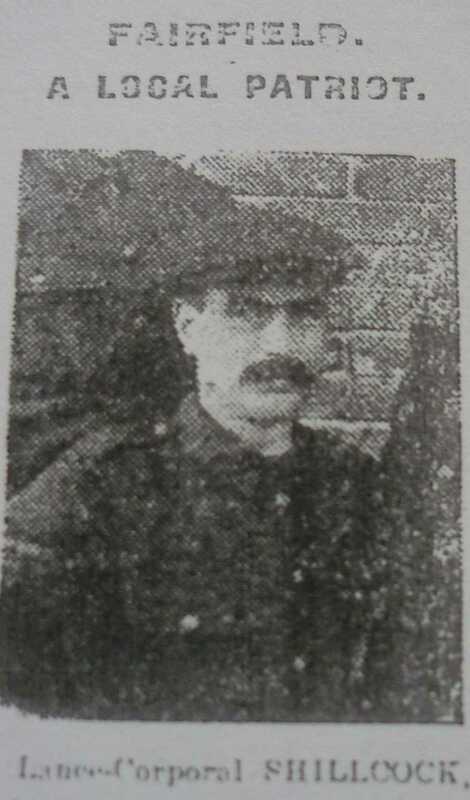 Alfred was also the cousin of Arthur Riley deceased during WW1. 1898 April – John Barker with son Harry. 1895 April – John Barker with son Jno. 1892 June – Tom Cooper with daughter Annie. 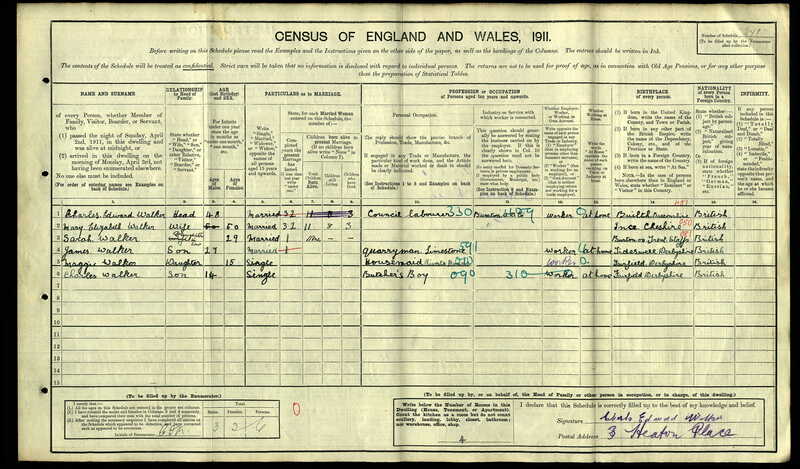 1893 April – Harriett Loreade? with daughter Frances. In the Census of 1871 all properties in Fairfield unless they were a Farm, Business or Large House were not named by street, only the residents are listed. Below are listed the children of families that lived in Heaton Place/Row that attended North Road School for which no house numbers were given…..
1879: William Arthur Slack, Robert George Wilson, Ada Blunt. 1884: Hannah Barker, James Holmes, Maggie White. 1886: Harry Smith, Emily Barker, Ernest Spencer, Mary E Spencer, Fred Bennett. 1887: William Holmes, Samuel Spencer, Mary Ellen Moss. 1888: Joseph Vanes, George Ward. 1894: Charles Vanes, William Morris, Lillie Robinson. 1896: Eliza Morris, Joseph Robinson. 1897: Beatrice Morton, Chas Wheeldon. 1898: John Bower, Fred Robinson, Ethel Riley, Annie Morris. Thank-you for the kind remarks, I have done some further research on Harry & have up-dated the site. I hope that you find it interesting. I will contact you separately with some further information. If you know any other descendants of any of the other men please point them in the sites direction. Val. Hello, I am following up a potential lead that my Grandmother (Gladys Hall, born 1908) lived in a poor area named Heaton Place with 7 siblings, 5 of which reportedly died (I believe some of the siblings were called Elsie, Lillian and Thomas). I believe but am not certain at this point her parents were named Mary Ann Lealand and Thomas Hall. Have you come across any mention of these names as residents? I am sorry it is so vague, I don’t have a lot of detail of my family history and trying to piece together what I can, Thank you In advance.